What does it take to sway the heart of a Russian politician raised on a steady diet of communist political propaganda? All it takes, if Boris Yeltsin is any indicator, is a trip to a modest American grocery store. In 1989 Boris Yeltsin, who would serve as the first president of the Russian Federation throughout the 1990s, was in Houston, Texas visiting the Johnson Space Center as part of a dignitary visit to the United States. 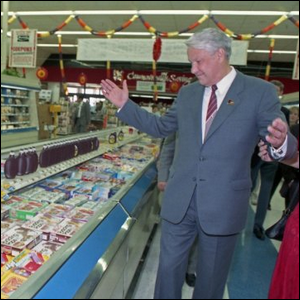 While in the area, Yeltsin insisted on going off schedule and visiting an American grocer to see where Americans shopped for food and what they ate. What could have been a simple visit to see how the locals lived turned into a life changing event for Yeltsin. He was absolutely overwhelmed by the sheer amount and variety of food located in Randall’s, the supermarket he and his entourage stopped at. He wandered through the store nodding his head and looking at all the produce, before turning to his companions and telling them that if Russians saw how well their American counterparts lived and ate “there would be a revolution”.